In order to use the space available more efficiently when planning control cabinets, alternatives to cable ducting and long cable bonding are increasingly becoming necessary. Depending on the cable cross-section, cable ducts can become overfilled, which causes confusion. The manufacturer FTG, from Triberg in Germany, has therefore added the flexible “BusSpeed” system to its range, with immediate availability. This offers shorter feed routes to up to four potentials – without any cable transfer ducting. 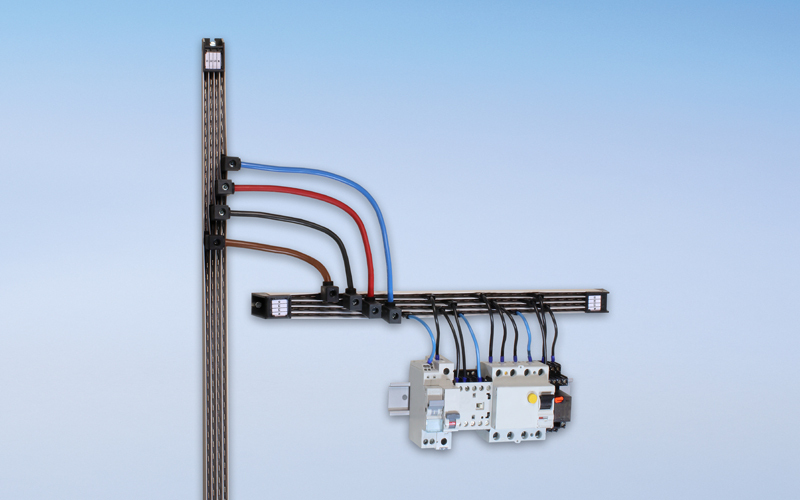 FTG has recently expanded its extensive range even further with its up to 4-pole, flexible control bus system BusSpeed. The control buses are generally used in control cabinets, where the need for individual solutions for power distribution and connection is highest. With a variation of devices of different sizes, a faster, simpler infeed can easily be achieved using cables. There is thus no need to calculate additional space for cable transfer ducts in the control cabinet. The design of the BusSpeed system means that the buses can be installed vertically and horizontally directly onto the mounting plate using a selection of different fixing brackets. Add-ons can be affixed to as many poles as required and are available in lengths up to 1.855 m. Because the assembly of the live bar allows up to four potentials including labelling on the fixing brackets, as many infeeds as necessary are possible. If a shorter live bar assembly is required, it can be cut to individual lengths or precut in the factory. Separation of the bar to divide the potential is also easy with disconnection. The bars in polished brass and galvanized copper are suitable for voltages of between 32 A and 125 A. Depending on the customer’s requirements in terms of control cabinets, the manufacturer offers a combination of other flexible systems from its over 10,000 products to allow maximum adaptability. These include the 250A phase bar Auxiclic and countless other components for power distribution and connection in control cabinets. To give more space here, the compact BusSpeed control bus system from FTG is the top choice if efficient, space-saving solutions are to be realized. The BusSpeed control buses from FTG provide needs-based solutions in control cabinet designs up to 1.855 m in height.